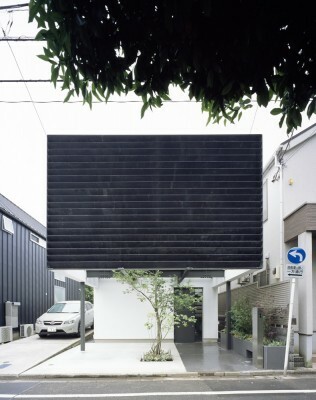 The site is located in a quiet residential area of Tokyo. The client is a couple who both work at a university. Upon planning the residence, their request was to keep two independent and equal private dens, and to provide an open living environment while maintaining their privacy. 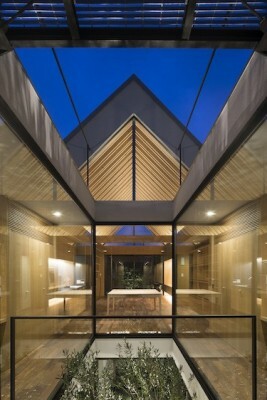 A courtyard and a front yard are placed on the south and the north and spaces are located symmetrically. 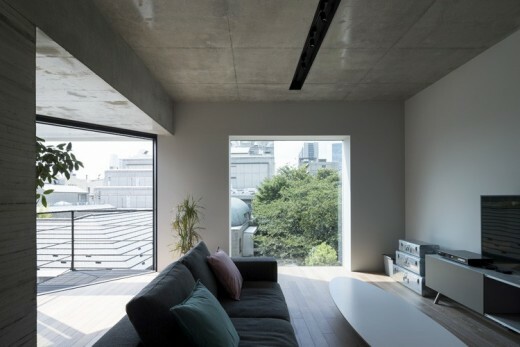 Our intention is to provide a living environment where one can feel the air outside from everywhere in the house such as private room or living and dining room. 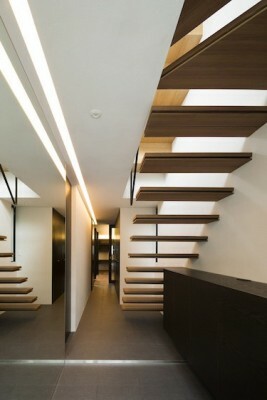 The box-shaped volume on the second floor sticks out towards the street. 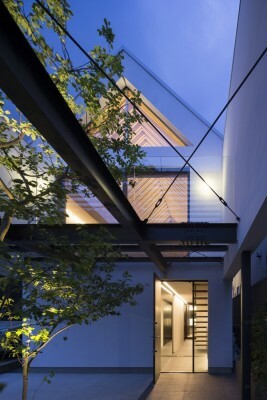 The front yard is enclosed by this overhanging volume, and becomes a garden for the living and dining room. The louver boards made of the hot-dip galvanizing with zinc phosphate coat protect the interior space from the eyes of passers-by on the front street. 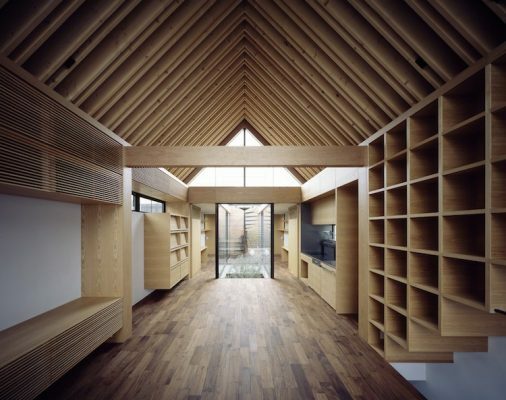 The couple’s dens and the children’s rooms are placed in the back of the first and the second floor, and the built-in furniture is provided along the wall, utilizing the narrow and long gap. This makes it possible to view the Griffith’s ash planted on the courtyard from all the rooms. 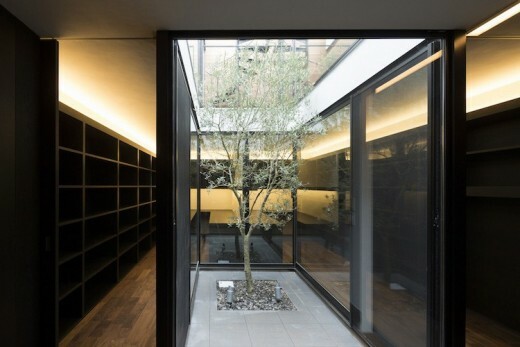 Each room is filled with soft light from the courtyard, and family members can feel each other’s presence while concentrating on their works or studies. 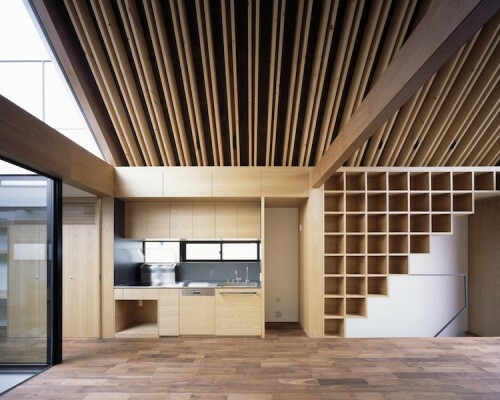 The living and dining room, and the kitchen are placed on the second floor with high ceiling. It is covered with a gable roof with the exposed doubled SPF rafters creating a bold rhythm and delicate shading at the same time.